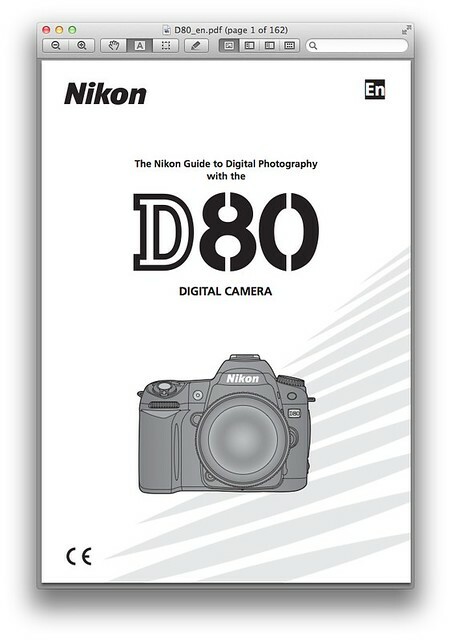 The printable version of the Nikon D80 Owner’s Operation Manual, aka “The Nikon Guide to Digital Photography with the D80 Digital Camera” is now available. Right-click or tap this download link for the Nikon D80 instruction guide (approximately 9.9 MB in size) to download it to your hard-drive or view in your mobile browser. Be sure to read the manual from cover to cover, and you’ll be rewarded with knowing interesting stuff such as how the built-in flash of the D80 can contribute to total illumination of a scene while in commander mode.